Quality Air Heating and Air Conditioning > Articles > Air Conditioning > How Do Ductless Mini-Split Air Conditioners Work? How Do Ductless Mini-Split Air Conditioners Work? Most of us are used to the traditional centralized air conditioners used in most homes, and it’s not hard to see why. They’re effective and dependable, and for most homes they do the job admirably. But what about homes that can’t support a centralized system, or for whom a centralized system is more trouble than its worth? For such homes, we recommend ductless mini-split air conditioners, which take a very different approach to the challenge of keeping your home cool. How do they work? And more importantly, are they right for your home? Centralized air conditioners cool the air in one single location in your home, then blow the air to the various rooms using a system of ducts. It works well because it’s comparatively simple, and with the bulk of the complex equipment located in one place in your home, it’s easy to maintain and repair. Unfortunately, not every home can support such a system. Houses built before the advent of air conditioning, for example, may lack the crawlspace required to support air conditioning ducts. Other homeowners are able to use centralized air, but struggle to keep their homes comfortable because they’re too large or feature unusual architectural quirks. In those cases, a ductless mini-split system makes an idea solution. Instead of one unit, the system entails multiple smaller air handlers placed throughout your house. Each unit is charged with cooling one room or section, and the controls of each unit can be operated independently of each other. No Ducts. The first and most obvious benefit is that you don’t need to use ducts to get comprehensive air conditioning. Ductless systems make an excellent fit for any home that can’t support ducts, but in which the homeowners don’t want to bother with inadequate methods like portable air conditioners or window box air conditioners. Luxury. Because the different units in a ductless mini-split system can be operated independently, you can use them to avoid squabbles over the thermostat setting and allow every member of your household to enjoy a comfortable home. For example, you might be watching television in the living room and want the temperature to be 75. Another family member in their bedroom might want things much cooler: setting the temperature to 72. Ductless systems allow you both to get what you want without either of you having to compromise. Savings. By extending that principle to its logical conclusion, the true benefit of ductless air conditioning becomes apparent. You can run the cool air only in those parts of the home you are using, while unoccupied rooms — bedrooms in the daytime, for example — don’t need to be air conditioned. It cuts down on both monthly bills and the possibility of further repairs. 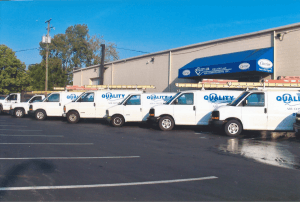 If ductless air conditioning sounds like a good fit for your Columbus, OH home, call the friendly professionals at Quality Air Heating and Air Conditioning.